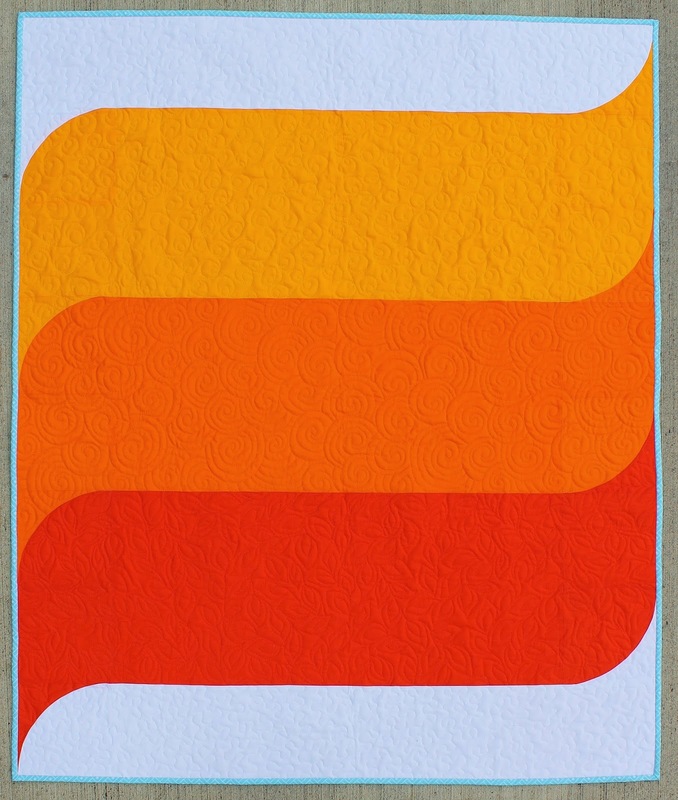 Thank you for your patience waiting for the pattern for the Waves Baby Quilt. 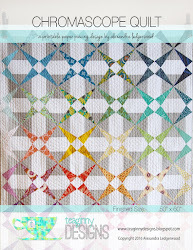 It is now available as a PDF for instant download in my etsy shop or in my new Craftsy shop. 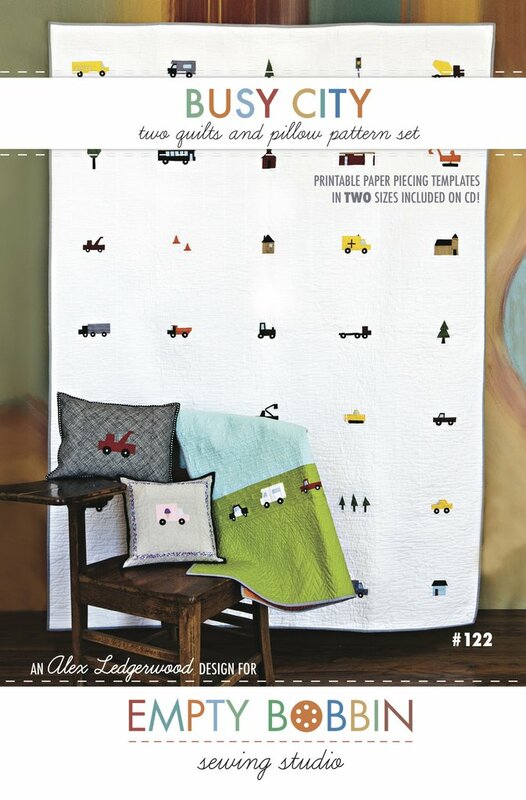 The 10 page pattern has full color diagrams, detailed instructions, helpful tips, and full sized templates. 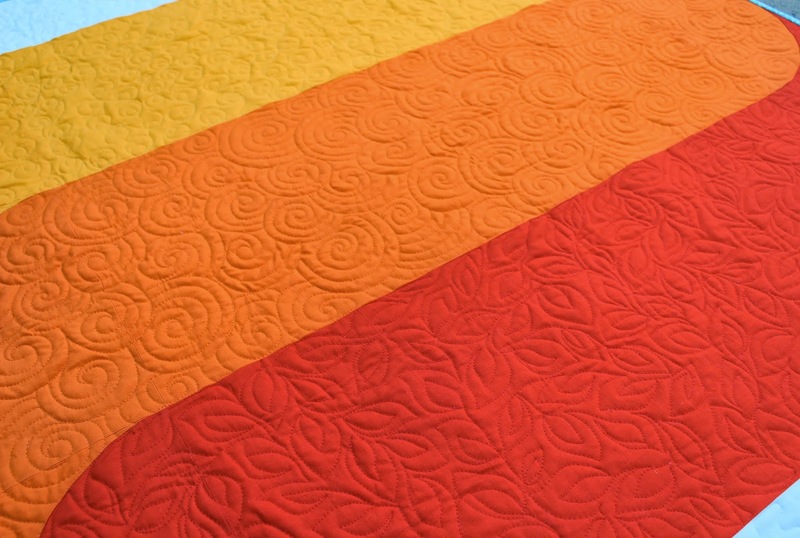 The quilt pairs quarter circle blocks with easy to cut rectangles and squares. It goes together very quickly, especially once you've cut the curved blocks. The quilt works perfectly for a boy or a girl, depending on the color you choose. 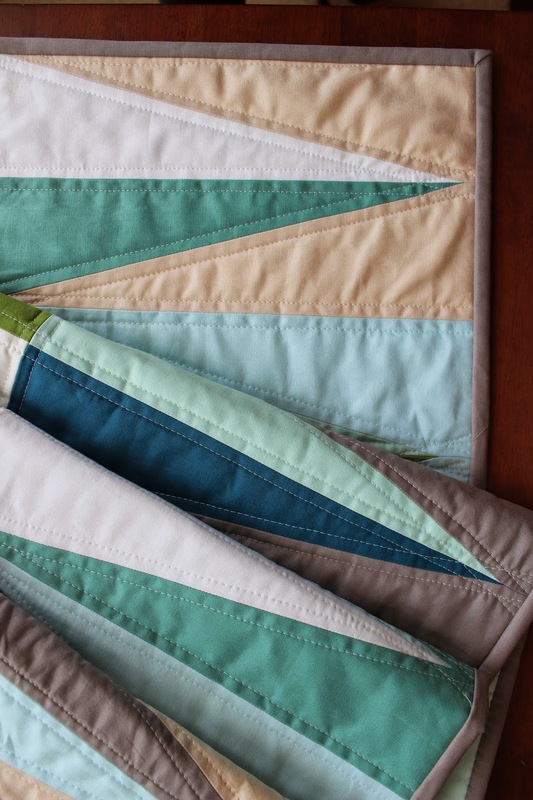 The design is bold and graphic, but simple enough to work well with a variety of nursery decors. 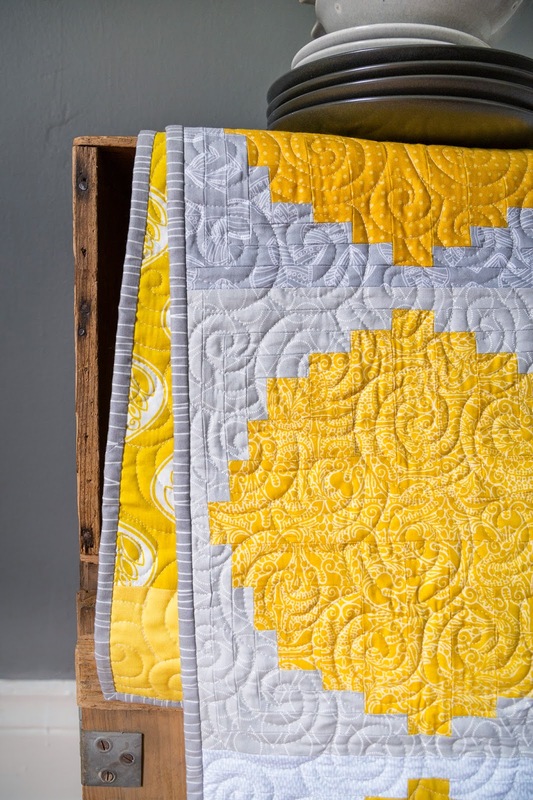 I can't wait to see your Waves quilts. 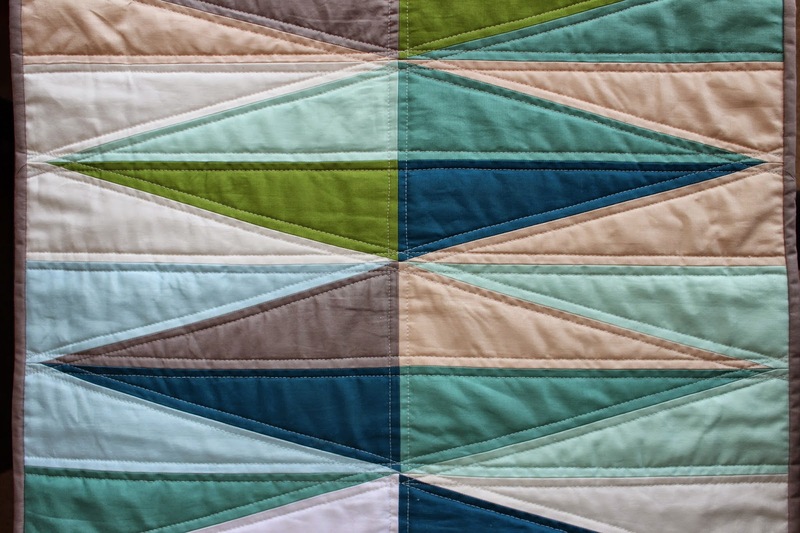 You can tag them #wavesbabyquilt on Instagram or upload them to my flickr group. 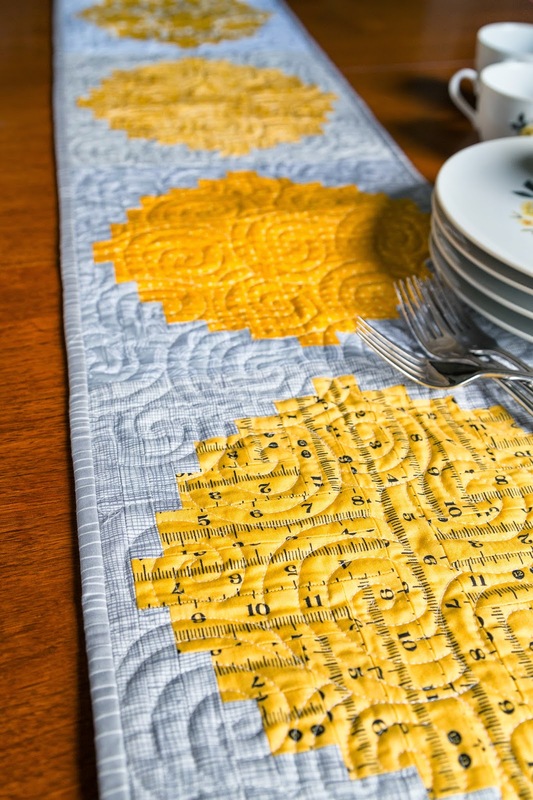 I was lucky enough to have Lauren Hunt photograph my sunshine table runner. All the photos in this post, in fact, were styled, shot and edited by Lauren. 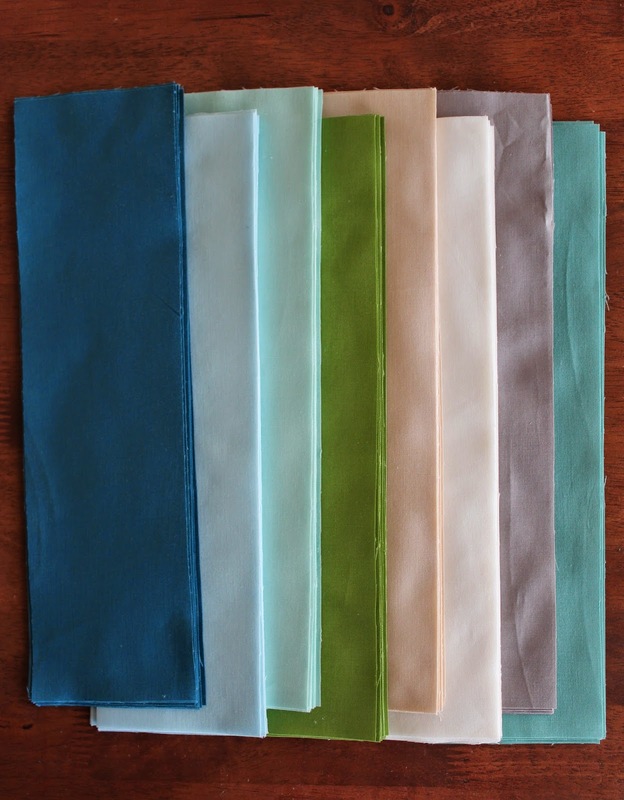 I have decided not to feel badly about how sad my pictures look in comparison because she is a professional photographer; she has a degree in photography and years of experience (besides being an amazing artist, illustrator, quilter, pattern designer, fabric designer, and person in general). 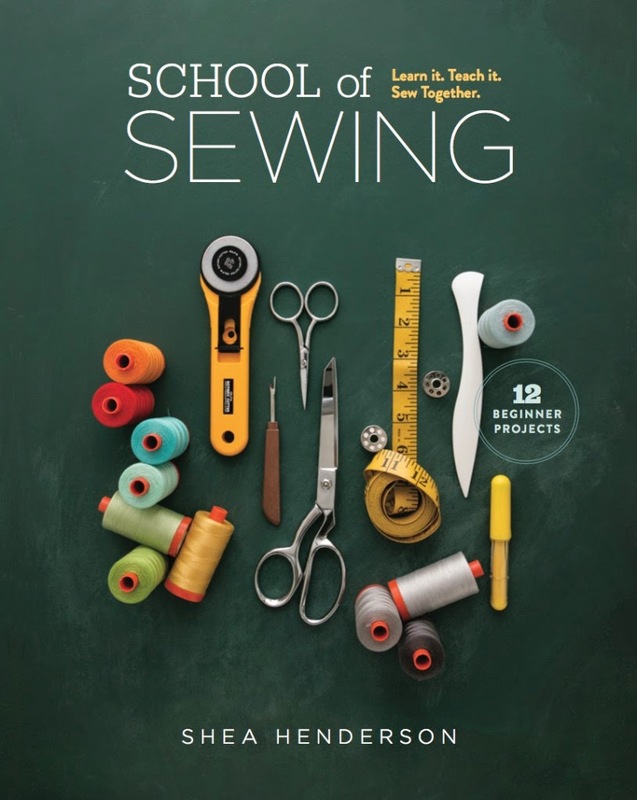 Most recently she was the photographer for School of Sewing, a Fall 2014 release written by Shea Henderson of Empty Bobbin Sewing, published by Lucky Spool. The cover alone tells you it is going to be so, so good! 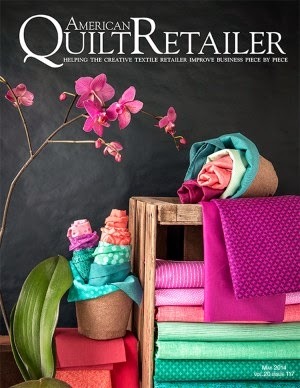 Lauren also shoots covers for American Quilt Retailer. So, you can see how striking and lovely her work is. Now, back to the runner. It is a gift for my mother-in-law, who asked me to make something to use for spring and summer décor in her dining room. She requested that it include yellow. 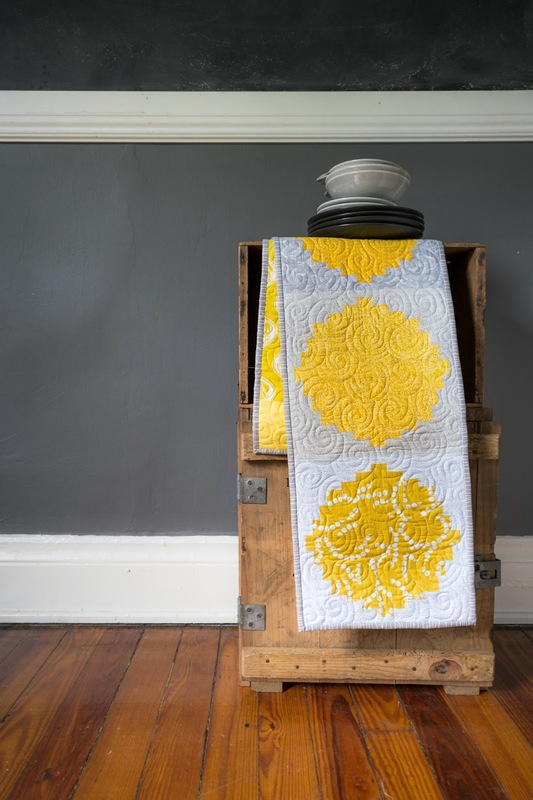 I wanted to create something sunny and fairly traditional to suit her house. I went with a common variation on the log cabin block. 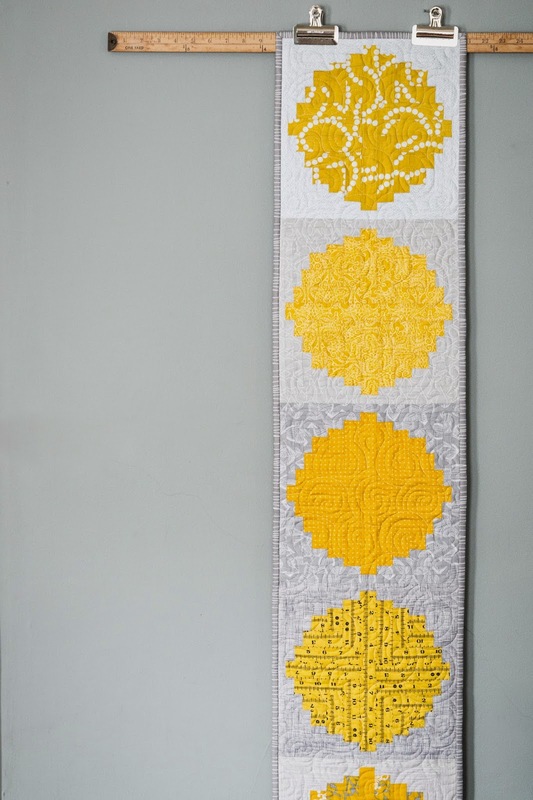 Each block uses a different pair of yellow and gray prints. 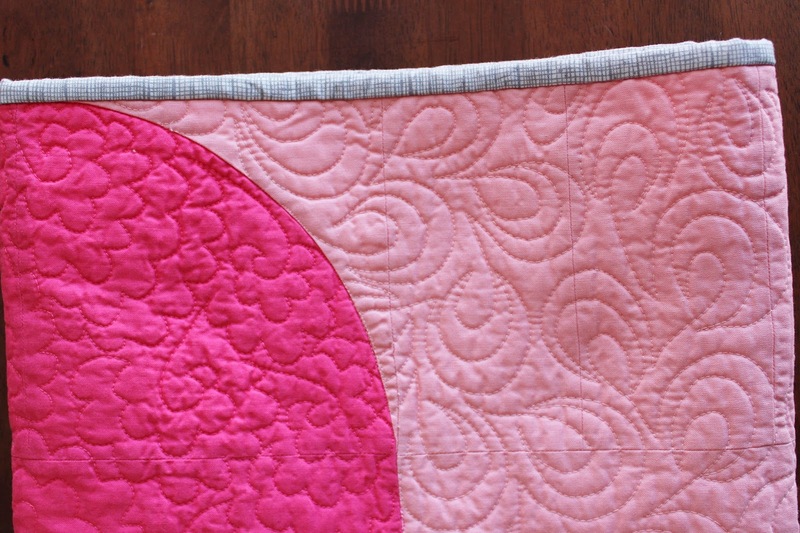 I quilted the runner with swirls with light gray Aurifil thread to echo the circular design of the blocks. 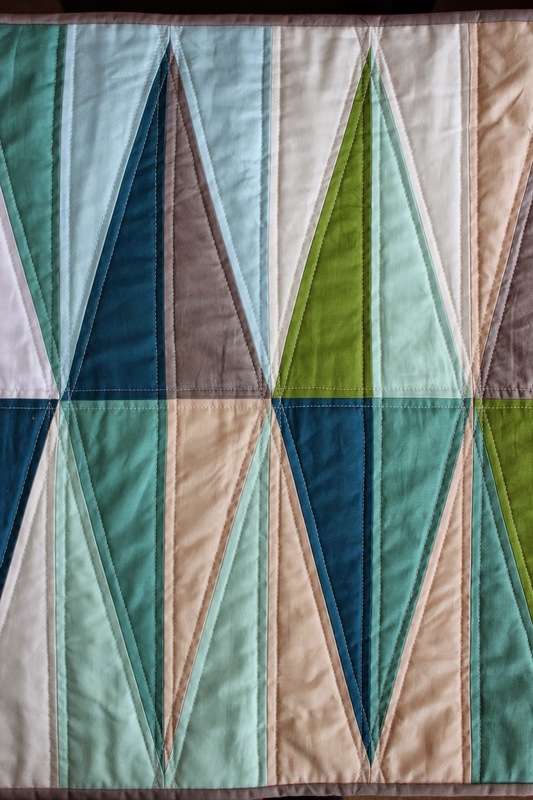 This earthy color palette and graphic, geometric pattern was inspired by a laundry basket I found on pinterest, of all things. I love the simplicity of the design, and the spear shape really appeals to me. I learned a few things about half rectangle triangles while making it, let me tell you. We are not close. But they are so pretty! 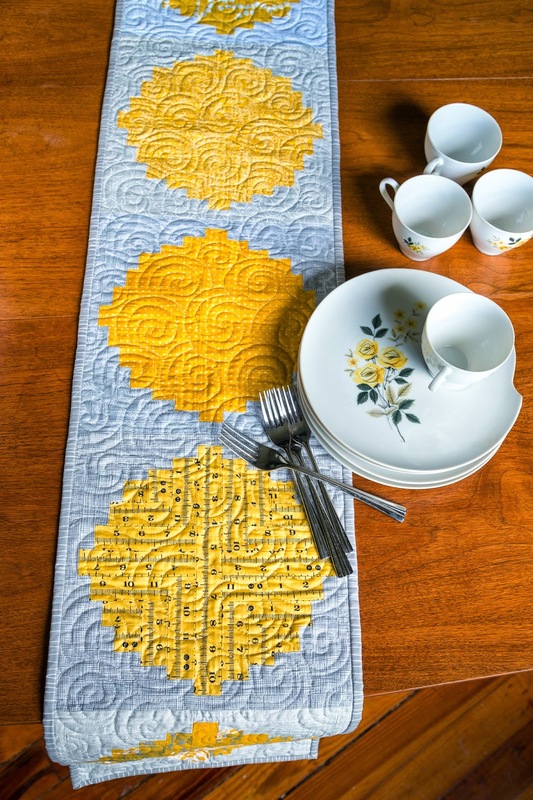 The table runner is quite generous at 22 x 65 inches. 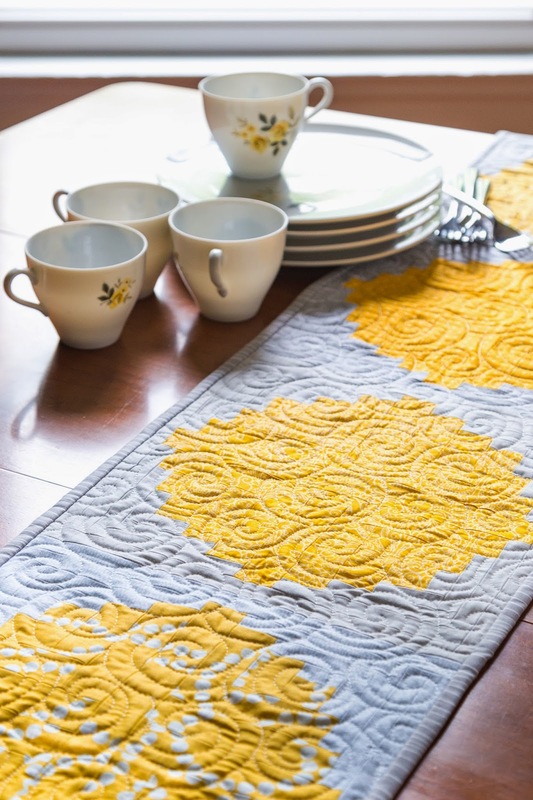 It would be perfect on a large dining table, or over the end of a twin bed, as a bed runner. 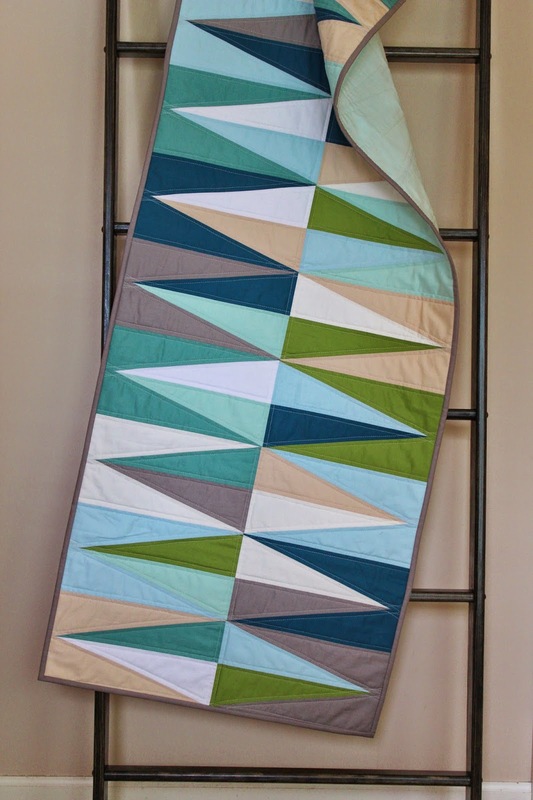 You can find this runner in my etsy shop, which is now open again. 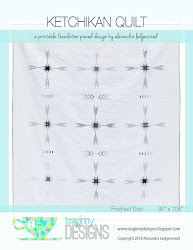 It is safe to say I will not be making this design again soon, so grab this one-of-a-kind piece while it is available.